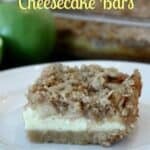 Apple Pie Cheesecake Bars with Granny Smith apples, a cream cheese filling, and an oat streusel topping! I LOVE this dessert. The End. 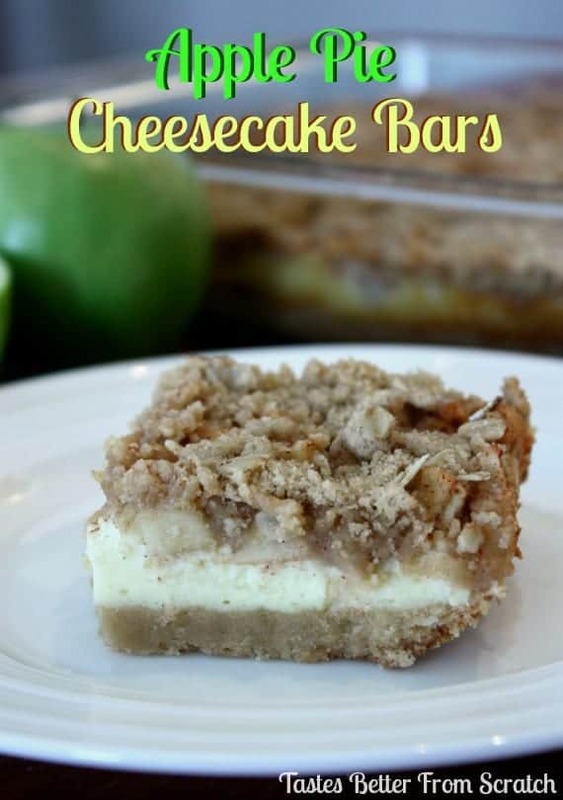 Ok, but really, these little cheesecake bars are to die for! Once upon a time an apple pie and some cheesecake had a baby and this beauty was born. They’re really simple to make and come out perfect! In a medium bowl, combine flour and brown sugar. Cut in butter with a pastry blender until mixture is crumbly. Press evenly into a 9x13'' greased baking. Bake for 15 minutes or until lightly browned. In a large bowl, beat cream cheese with 1/2 cup sugar until smooth. Add eggs, 1 at a time, and vanilla. Pour over warm crust. In a small bowl, combine all ingredients for the streusel topping. Sprinkle evenly over top of dessert. Bake 30-40 minutes, or until filling is set. Oh my, these bars look delicious!!! All the layers sound so good! The perfect dessert for fall! Thanks Maria! They are SOOOO good, hope you get to make them soon!! I love this! Thank you for this recipe! Possibly my new favorite dessert! Thanks for a great recipe!